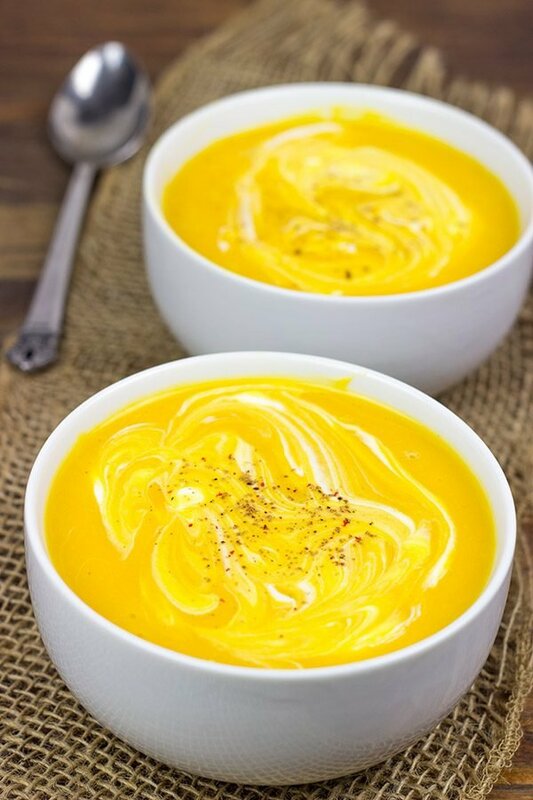 This Butternut Squash and Cider Soup is easy, healthy and perfect for a chilly Fall day! We’re down to just about 5 weeks until my wife’s due date. That’s soon. Like really soon. But we’re total planners around here, and I think we are more or less ready to go. My office has been relocated to the basement, and the baby room is all set. All of this baby prep has made me really think back to my days growing up in the Carolinas. And guess what memory popped into my head the other day? Just guess. Carmen Sandiego. That’s right. The old-school video game featuring that dastardly Carmen and all of her henchmen. As far as I know, this game was only available on PC, but it was one of my favorites. I still remember the names of Carmen’s henchmen, too. Together, they formed the V.I.L.E. crime syndicate, with some of Carmen’s top villains being Patty Larceny, Jacqueline Hide, Vic the Slick and Justin Case. Pretty creative names, huh? Where in the World is Carmen Sandiego? was an educational game. It came with a world atlas to help track down the bad guys. In fact, I swear that atlas is still on a bookshelf in my mom’s house. Hah! Carmen was so popular that PBS even turned it into a game show for kids. My sister and I would race downstairs to catch that show after dinner…it drove my dad nuts. But we were learning about world geography, Dad! And the theme song? C’mon…you remember that theme song! It was performed by Rockapella, who by the way still tours the country. I knew that theme song by heart! Ok, enough road-tripping down memory lane there. Let’s turn our attention back to food! As the weather is turning chilly here in upstate New York, we’ve had our mind on soup lately. Last Fall, my wife and I went over to the culinary school in our area for lunch, and I ordered a butternut squash and cider soup as a starter. This soup was a knock-out! 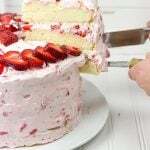 It was rich, creamy and loaded with flavor. 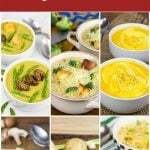 I actually took several baking courses a while back at this culinary school, so I asked one of my former teachers about the recipe for this soup. Turns out they had adapted it from one printed in the New York Times. A quick Google search once I got home, and there it was. Butternut Squash and Cider Soup. One bite of this soup, and you’ll swear that it’s loaded with cream. 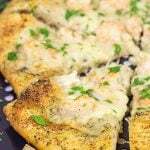 It’s got such a rich, creamy flavor and texture that you’ll swear it can’t be healthy. Wrong! There is absolutely nothing bad for you in this soup. 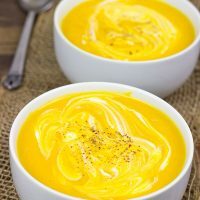 The flavors from the butternut squash really shine, and the apple cider provides a nice sweetness that balances this soup. 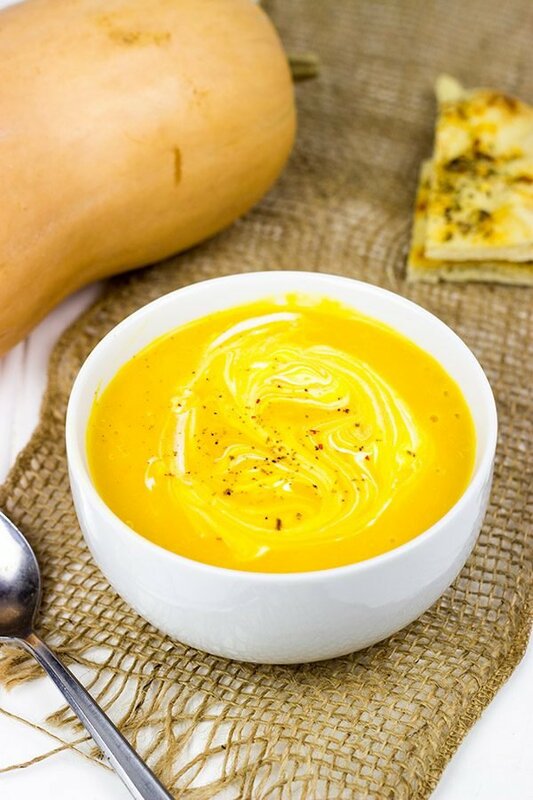 If you’re looking for a delicious Fall soup, then look no further! 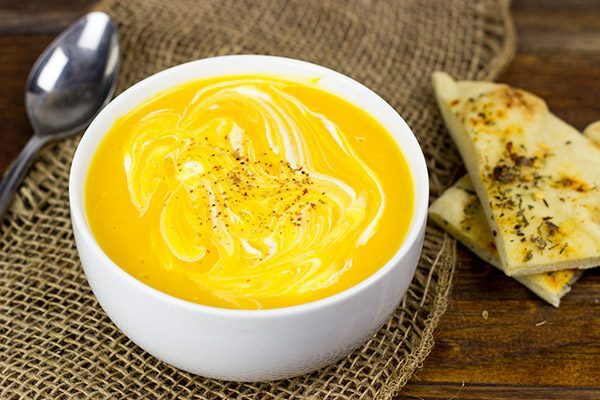 This Butternut Squash and Cider Soup recipe is definitely a keeper. Oh, and did I mention how easy this soup is to make? It only takes about 30 minutes from start to finish. Seriously. The hardest part is actually peeling and chopping the butternut squash. Enjoy! 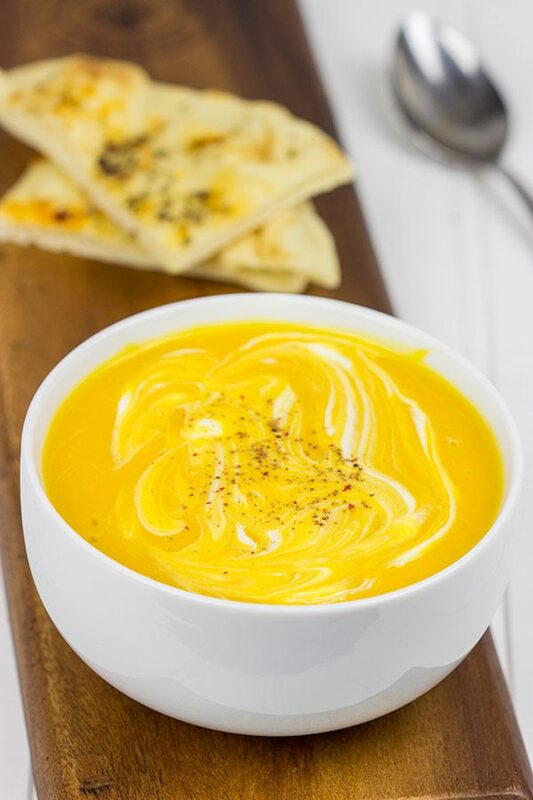 Did you make this Butternut Squash and Cider Soup at home? Leave a comment with your thoughts! Or snap a photo and tag me on Instagram (@Spicedblog). Using a medium-sized Dutch oven, add shallot, garlic and water. 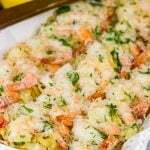 Place over medium heat and cook for 2-3 minutes, or until shallot and garlic have softened slightly. Add butternut squash and chicken broth. Bring mixture to a boil and then reduce heat, cover and simmer for 20 minutes, or until squash is soft. Add cider, sour cream and salt. Continue pureeing until well-mixed. Ladle soup into bowls and garnish with diced apples, additional sour cream and black pepper before serving. Ha! I remember that game! So funny how memories pop into our heads… This soup looks like one to remember! The color is so beautiful and I love that you used apple cider in the soup! So perfect for the season ~~~~~ LOVE! Just looking at that soup made me think it was full of cream – but you only have a half cup of sour cream in it – this looks insanely comforting, David! And wow – Rockapella are still touring? They are almost as old as my fav band “A-Ha” – who are in the middle of touring right now! And I even used light sour cream, Shashi! I know it doesnt have the same flavor as the full-fat version, but hey, it’s less calories, too! 🙂 And yes, Rockapella is still touring. I almost went to see them in Atlanta a few years back, and then they came through Albany last year…but we were out of town. Of course, they only have one song that I actually know. Haha! Taaaaake on meeeee…..
Hi David! Perfect! I have at least twenty-five butternut squash on the table on the back porch, not to mention the dozen or so spaghetti squash! Some of my favorite fall/winter soups are chowders and, of course, homemade creamy tomato which I make with my canned stewed tomatoes. Is that your own pita bread I see? Thanks for the reminder, Dorothy! My wife told me the same thing! We grow zucchini every summer, and it loves to take over the garden, too. I’ll come up with a way to make it work for next year!! I really want a bowl of this soup now! And your pictures are awesome. Great job! I can’t believe it’s almost time for your little one to make his debut! Exciting times! Man I loved “Where in the world is Carmen San Diego” too, I used to play it on my dad’s Mac Plus. Endless hours of fun..
About this soup: it looks fantastically tasty and easy and I’m really digging the apple cider addition. What a fun twist. I can’t wait to try it! Tell me about, Mike! Wouldn’t it be fun to go back and play that game again? I’d probably get bored a lot faster…but I dunno. That game was pretty unique! This soup is absolutely fantastically easy and tasty…and really not bad for you at all. Perfect for chilly Autumn days! I’ve also been obsessing about soup so this is timely. Thanks! Your wife is lucky that you are the cook! What a stunning color! This looks crazy delicious 🙂 Cool idea to top with apple! I love the beautiful color of this soup David, looks so comforting! I bet you’re not fully prepared to such a significant event, David! Did you know it’s important to grow a lot of lavender? I don’t know what’s the point to do that, but it’s been so since the dawn of time! Don’t ruin and old good custom. Besides, you can always incorporate it in your cooking (finally!) or even send it to me. But you still have 5 weeks – not a lot but enough to grow it. In a meanwhile, I’ll be enjoying with this delicious soup. And cider? Seriously? Count me on, please! Wait? Grow lavender? Why would I do that when I’ve got you growing enough for a small army up there? 🙂 But wait…I do have a recipe coming up with lavender in it! Just you hold your horses! I love, love, LOVE butternut squash soup. 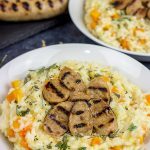 It is perfect for this time of year because it is comforting, but cheap to make too. Cider in soup is a new one to me, but I shall be trying that soon. Butternut and cider?? Yes, please! Your pictures are gorgeous! I remember the show and the song, but I don’t think I ever played the video game. Only 5 weeks to go! Woo-hoo! It’s so exciting getting ready for a baby! 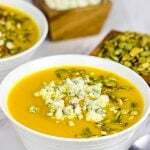 I’m totally digging this soup and all things butternut right now. I just had some butternut soup at BLTSteak the other day and it was soooooo good, but I bet yours is better! Seeing as I just picked up some cubed butternut squash from Costco, this should be a snap to put together. I mean I can only have so many roasted veggies and this sounds great to make on these recent chilly evenings. Love the sour cream, too! Tell me about it, Kevin…the time flew by when we played those games! Hey, we could have been out doing other stuff…like getting into trouble. Plus, I think you know a thing or two about San Diego already….just not Carmen. 🙂 And it sounds like you are already half-way there with this recipe. 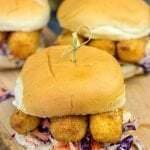 You could have it in time for lunch today! Carmen Sandiego!! A lot more educational and friendly than the video games I played (uuhhh Street Fighter yes pls). Haha…you are way too kind, Kennedy! 🙂 I did indeed have fun making this one, but I was like “oh no” when I saw the soup. It was a pretty orange color…but that was all it had. The sour cream was clutch there at the end! I hope you have a great weekend, and thanks for being such a good blog friend! 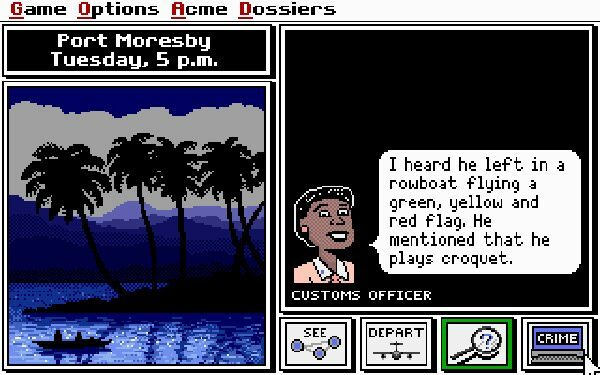 Carmen Sandiego is the sole reason why I was that annoying kid who knew every capital city and also knew where Port Moresby was. I was OBSESSED with that game! Now this soup, I could use it to fuel an epic 24 hour CS binge to catch her. Hahaha. That was YOU! You were THAT kid, Arman. Somehow I just knew it. And Port Moresby…bwahahaha! Let’s quit our jobs and go chasing after Carmen. Deal? Yesssss! Carmen Sandiego!!! Played the game, watched the show, LOVED Rockapella. Yes. Oh, and the soup looks good too and all that. Have you seen Carmen lately, Amy? I heard she got a facelift and she’s hiding in Puerto Vallarta. Someone needs to apprehend her! !